Ponga tree- Tauranga DP #10. 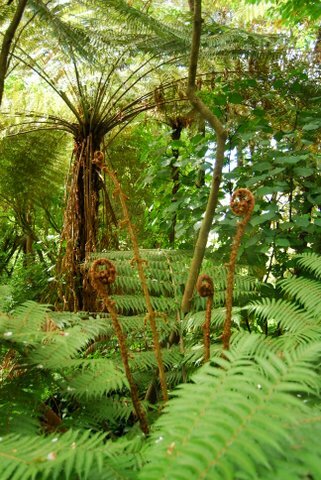 NZ Native Ponga Tree (Tree Fern.) 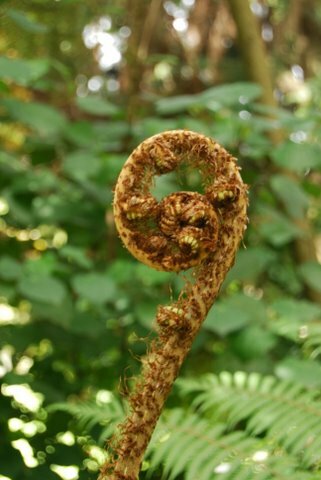 The large unfurling frond in known as a “Koru”. The frond “unwinds” itself revealing smaller rolled up stems which grow the leaves. Each frond and strem opens until it has become one of the large fern branches you can see in the canopy and shooting out all around the frond. An amazing feat of nature that goes on silently each day. You can see a close up of a single Koru below. When the fronds die off they fall down back onto the tree’s trunk and hang there unril either narture or garvity drops them to the ground below, where they will eventually return to the earth they came from. Even in the city I have no trouble finding green spaces to hide away in. Tauranga isn’t a bad city to live in, it’s just that I am a country kinda girl at heart and just because I live in a city dosn’t mean I have to be at the heart of it, admist the traffic and commericalisim. I count myself fortunate that I live close enough to be able to enjoy the positive aspects of living in a city, yet close enough to find areas where I can be alone in the bush taking photos and enjoying the birds. INTERNATIONAL BLOG ACTION DAY FOLLOW UP: Yesterday saw a record number of visitors drop by my blog, my thanks to all that visited! Some of the visits here were directed by links from other CPD bloggers, 1 was Greenville Daily Photo which looks at education being a key tool in helping fight poverty and also has a thought provoking post on homelessness entitled “those amongst us.” Please go and check both posts out! I posted to a simialr theme here so if you missed it please take a look! A lovely London DP blogger posted a link to my blog on there post about being non-judgemental of those that are living in poverty. (Just follow the link to read the post!) On the International Blog Action Day I came accross this post by a digital photography school- 17 photos of poverty. and I reccomend you book mark this site and pay it a visit. Very thought provoking photography! Nice to see Taurange with a daily blog!!! I had a friend, great Photographer, Scott Johnson , rest in peace, he was from Tauranga…glad you can show us this amazing place!! Thanks Barb, I must admit I was a bit suprised I didn’t find another Tauranga daily blog on CDP! Sorry for your loss. Baruch, thankyou. I will visit Auckland via your blog shortly! I will be glad to show you my version of Tauranga! This lools like the place where I bagged my last T Rex. Took 97 shots, but man it was worth it. Fed a village in NZ for two weeks. Tastes like a big nasty chicken. What a strangely beautiful plant. Excellent close up too.